VOTED BEST IN SENIOR LIVING 2017! Pacifica Senior Living Tucson - Tucson, AZ is proud to announce that they have been selected as one of the 2017 Best of Senior Living Award Winners on SeniorAdvisor.com, the largest ratings and reviews site for senior care and services in North America. 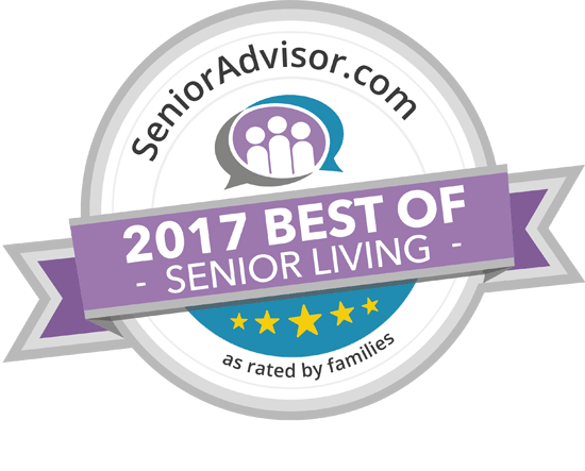 SeniorAdvisor.com’s Best of 2017 Award winners represent the best of the best of in-home care, assisted living, and other senior living providers, based on the online reviews written by seniors and their families. This exclusive designation honors the top one percent of senior care providers across the country. "Families are increasingly looking to online reviews to find out who truly delivers great care for our seniors, not just who claims to deliver great care," said Eric Seifert, President of SeniorAdvisor.com. "Our SeniorAdvisor.com Awards program is all about celebrating the exceptional people who do just that. We're honored to spread the word about these organizations whom families can entrust with the care of their senior loved ones." To qualify for inclusion in the Best of 2017 Awards, providers must have maintained an average overall rating of at least 4.5 stars while receiving three or more new reviews in 2016. Additional details and a complete list of award winners can be found on SeniorAdvisor.com. To see the full list of award winners in Tucson, please visit here. About SeniorAdvisor.com LLC SeniorAdvisor.com is the largest consumer ratings and reviews site for senior living communities and home care providers across the United States and Canada. The innovative website provides easy access to the information families need when making a senior care decision, and features trusted reviews and advice from local residents and their loved ones. For more information, please visit www.SeniorAdvisor.com or call (866) 592-8119. At Pacifica Senior Living Tucson we offer year-round activities & events for all residents that are specifically developed for their assisted living and memory care lifestyles in Tucson, AZ. Our centrally located campus is close to shopping, parks, and other areas of interest in Tucson, AZ. We also strongly encourage family members to be involved by attending special events, outings, or by participating in our daily activities. To stay up-to-date on all the special events at Pacifica Senior Living Tucson see below for our senior living events calendar.